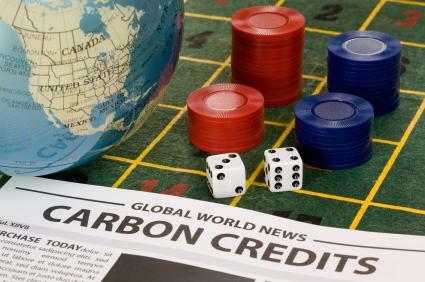 As more countries and companies take steps to lower their carbon dioxide emissions, you hear the term "carbon credit" used frequently in the news. Understanding what a carbon credit is and how it is traded can help you better understand both the impact of carbon dioxide and responsible steps companies can make to reduce it. Carbon credit is a fairly simple system that can become more complex through trades, purchases and swaps. Put simply, countries and individual companies can earn carbon credits, each of which allows the industry to produce one ton of carbon dioxide gas over and above their limits. Credits are awarded to countries and companies that take steps to lower their carbon dioxide emissions. This can be done in a couple of ways. Lower . A company which plants enough trees to reduce carbon dioxide emissions by Production: Carbon dioxide emissions can be lowered by upgrading equipment, changing manufacturing procedures or using the equipment which produces the gasses less. For each ton of gas the manufacturer stays below their set limit, they are awarded one credit. Environmental Action: If a country or company funds environmental actions aimed at reducing carbon dioxide, this can also translate into a credit. For example, carbon dioxide gas is used by plants and trees, which in turn give off oxygen one ton, would be awarded one carbon credit in exchange. Carbon credits are frequently used in one of two ways. They can be saved or traded. Some manufacturers have fluctuating production loads. They may produce more carbon dioxide one year than the following. If a company has an emissions quota of 15 tons, meaning they can produce up to 15 tons of carbon dioxide, but only uses 12 of them in one year, they receive three carbon credits. If production is ramped up the following year and the company is set to produce up to 18 tons, they can use those three credits to balance out their emissions. Some companies rarely use their full emissions quota, or they may take part in environmental actions, which earns them credits. Other companies, however, may routinely go over and above their quota. In this case, a company about to exceed their quota can purchase a credit from the company who holds unused credits. Carbon credits can be traded on an international market. This can be done privately, through sales directly to one company or country from another, or it can be done through an exchange. There are currently six exchanges trading in carbon credits, and each sale is monitored by the United Nations Framework Convention on Climate Change. The carbon credit market is thought to grow larger as even countries that are not held to carbon quotas, such as the United States, get involved with voluntary trading and exchanges. The goal of the carbon exchange is to universally lower the amount of carbon emissions being produced, which will in turn lower the amounts of air pollution and the threat of global warming. While credits can change hands, prices are dictated by the current marketplace. This means that while some companies will always be looking to purchase credits for a one-time use, it makes better financial sense for many companies to lower their emissions to their set quota, rather than to risk fines or purchase large amounts of credits. Credits can, however, buy a company time to make the adjustments because in the short term it may be more practical to purchase credits than undertake a major overhaul of equipment and business purposes.